plus the commercial banks' reserves held in the central bank . The monetary base should not be confused with the money supply, which consists of the total currency circulating in the public plus certain types of non-bank deposits with commercial banks. Open market operations are monetary policy tools which directly expand or contract the monetary base. The monetary base is manipulated during the conduct of monetary policy by a finance ministry or the central bank. These institutions change the monetary base through open market transactions: the buying and selling of government bonds. For example, if they buy government bonds from commercial banks, they pay for them by adding new amounts to the banks’ reserve deposits at the central bank, the latter being a component of the monetary base. Typically, a central bank can also influence banking activities by manipulating interest rates and setting reserve requirements (how much money banks must keep on hand instead of loaning out to borrowers). Interest rates, especially on federal funds (ultra-short-term loans between banks), are themselves influenced by open market operations. The monetary base (MB) has traditionally been considered high-powered because its increase will typically result in a much larger increase in the supply of demand deposits through banks' loan-making; a ratio called the money multiplier. If a country’s gross domestic product is declining or growing sluggishly, monetary policy can offset this with open market purchases of bonds, which expand the monetary base. This expansion of the base in turn leads to expansion of the money supply and to downward pressure on interest rates, which makes it less expensive for consumers to buy consumer goods and for companies to purchase new physical capital; the increase in these types of expenditure gives an upward push to gross domestic product. On the other hand, if gross domestic product is growing at an unsustainably high rate, threatening to cause an increase in the inflation rate, contractionary open market operations can be used to slow the economy down. As of February 2019, the monetary base in the United States was about USD $3,353,484,000,000 (about 3.4 trillion dollars), up from about $832,999,000,000 (about 0.8 trillion dollars) in March 2008; this dramatic more-than-three-fold increase was a response to the financial crisis of 2007–2008. ^ See, e.g., U.S. Federal Reserve System regulations at 12 C.F.R. section 204.5(a)(1) and 12 C.F.R. section 204.2. ^ See, e.g., U.S. Federal Reserve System regulation at 12 C.F.R. section 204.5(a)(1)(i). 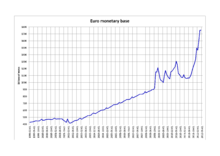 ^ "Monetary Base; Total". Economic Research – Federal Reserve Bank of St. Louis. Brunner, Karl (1987). "High-powered money and the monetary base". In Newman, Peter K.; Eatwell, John; Palgrave, Robert Harry Inglis; Milgate, Murray (eds.). The New Palgrave Dictionary of Economics. New York: Macmillan. doi:10.1057/9780230226203.2726. ISBN 0-935859-10-1. Retrieved 8 February 2011. Goodhart, Charles (1987). "Monetary base". In Newman, Peter K.; Eatwell, John; Palgrave, Robert Harry Inglis; Milgate, Murray (eds.). The New Palgrave Dictionary of Economics. New York: Macmillan. doi:10.1057/9780230226203.3102. ISBN 0-935859-10-1. Retrieved 8 February 2011. Cagan, Phillip (1965). "High-Powered Money". Determinants and Effects of Changes in the Stock of Money, 1875-1960 (PDF). Cambridge, Massachusetts: National Bureau of Economic Research. pp. 45–117. ISBN 0-87014-097-3. Retrieved 8 February 2011.